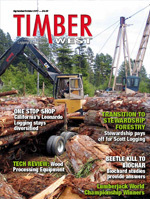 TimberWest Magazine September/October - Why a Steel Bridge? 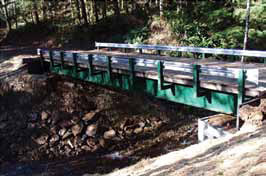 Steel bridges are the number one choice for replacing stream crossings. Modular Steel Bridges (MSB) can be designed and fabricated economically to fit the specific site location with ease. Most stream crossings we see today are less than 100 feet, making them a perfect match for installing an MSB. Most sites already have excavators on site, and it is often easy for those excavators to install an MSB due to its modular design and light weight — saving time and money, rather than bringing in additional equipment for installation of other heavier designed bridges. Many bridge sites in the woods are far away from major roads with sharp turns, rough forest roads, and difficult access. MSBs are designed in sections, typically two 8-foot wide sections of the length required to cross the stream. The narrow width of the modules allows for easy transport to the site. Although 8-foot and 16-foot modules for clear travel between guardrails are typical, modular steel bridges can easily be designed in almost any width to match the needs of the specific project. Modular steel bridges are pre-engineered and pre-fabricated often in a shop environment, eliminating any major fabricating or piecing together on site. This makes onsite installation extremely fast and easy. And because a majority of our bridges are installed by crews who have never installed a bridge, an MSB is an efficient and safe choice. When looking at purchasing an MSB, one should consider looking for a fabricator that is certified with the American Institute for Steel Construction or is AISC certified for simple steel bridges. The AISC certification requires fabricators to adhere to certain guidelines for steel fabrication, and it also ensures you are getting the best in fabricators and end product. Purchasing an MSB is very simple if you know a few things ahead of time. First, you need to know the minimum width and length required for your project. Second, you will need to know what loading is needed. Loading standards we see are HS-20 and HS-25, and we also see plenty of U80 bridges for timber industry related purposes. The U80 allows heavier loads that are typical to the timber industry to cross the bridge without damaging the bridge. Third, you will need to know the wearing surface required. Most standard MSB comes with 4¼” x 12” galvanized corrugated steel deck. This type of deck requires a wearing surface to be applied on top of it. Most common is gravel or asphalt applied to the deck in the field. Gravel is relatively easy to get, but the down side is that gravel is a maintenance headache—as vehicles travel over the gravel it pushes out, and the owner is continually trying to maintain the gravel wearing surface. The asphalt wearing surface is much better although it can be difficult getting asphalt to the job site in the woods and can also require maintenance in the future. The other option would be to add a wood running surface, which is generally used for portability of the bridge. One of the more popular wearing surfaces is an MSB with a bolt-on, precast concrete deck. The MSB with bolt-on, concrete deck panels is similar to the standard MSB, but it doesn’t require a wearing surface to be applied in the field. The MSB with bolt-on, precast concrete deck panels shows up at the job site with the same sub structure as the standard MSB, but instead of the steel deck attached, it comes with 16’ wide x 5’ precast concrete panels. They can be set using an excavator on site and are bolted together with ease. The great thing about an MSB is you have an instant, very durable, and long lasting wearing surface. The MSBs with bolt-on, precast concrete deck panels are designed and fabricated entirely in one facility ensuring utmost quality and proper fit in the field. The MSB with precast concrete deck panels is quickly becoming the “go to” bridge. During the last few years, we have seen the number of MSBs with precast concrete deck panels outnumber the standard MSB with galvanized corrugated steel decking. I think this is due to our customers realizing the huge benefits of installing a bridge with a concrete deck: low maintenance for years and the option to unbolt the bridge and move it to another site if needed. An additional benefit is that steel is the most recycled product in North America. More steel is recycled annually than paper, plastic, aluminum, glass, and copper combined. A588 weathering steel is the preferred type of steel for bridges. Weathering steel creates a barrier that will protect the steel for many years to come and eliminates the need to paint the bridge due to alloys causing the steel to rust. In closing, if you are looking at a project that requires a bridge, I encourage you to start with a reputable bridge designer/fabricator. There are a few good ones out there that have been designing and fabricating bridges for many years. Henry Kallis is the sales manager at RTI Bridge, which as been providing bridge solutions for over 25 years. Henry can be contacted directly at (406) 529-8808 or henry@rtibridge.com.